After last week’s episode and what is sure to be another amazing season finale airing this Thursday, we don’t need the Emmys to tell us that Louie is without a doubt the greatest comedy on TV. It may even be the greatest show ever. Follow David Bogner through the last season. A few weeks ago I told you about the upcoming third season of Louie, a semi-autobiographical masterpiece created by the red haired, balding genius Louis C.K. for FX. Back then I came up with a short introduction to the work of C.K., a stand up comedian with Hungarian roots who believes in masturbation as much as he does self-marketing. This may or may not have compelled you to watch the last season of Louie, but either way, I was so blown away by the power and emotional impact of last week’s episode that I felt the urge to do another post on the topic. Especially, since Louis C.K. won the Emmy on Sunday night for Outstanding Writing for a Comedy Series, but didn’t get the one for best acting (Charlie Harper – seriously??) and directing (instead Modern Family won). To give you an idea how desperately wrong this decision was, imagine Martin Scorsese never winning an Oscar or Usain Bolt not winning Olympic gold in the 100 meters. The third season of Louie is exceptional in so many ways, and you need to find a way to watch it immediately after reading this in case you haven’t done so yet. I promise you, you will be on the verge of tears both from laughter and because you care for this character so much and want to see him succeed so badly. 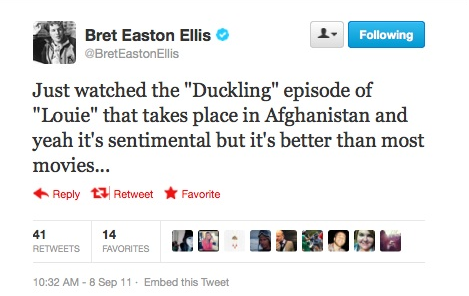 Even king of the unsolicited opinion Bret Easton Ellis gives it the thumbs up. It’s only fair to say that all seasons so far have been great, but while season one and two were more stand up comedy oriented with the shows signature beginning set at the Comedy Cellar in Manhattan, season three changed the formula by having episodes with no stand-up at all. And, despite the initial skepticism, those episodes turned out to be some of the best 20 minutes in TV history. Take “Miami” for example, the episode in which Louie has booked for a few shows at a hotel in Miami and becomes friends with a lifeguard who thinks he saved Louie’s life. With all its absurd comedic elements and funny misunderstandings I still believe I haven’t seen a more heartwarming story on TV ever before. The episode also succeeds in boiling the difficulties of male friendship down to an essence and makes passing fun of men’s fear of homosexuality. Everything else aside, it’s the writing and – of course – Louis C.K. himself that make the show so exceptional. Another episode I will never forget was the one in which Louie had to face his father but all along the way got constantly sick from fear and anticipation. It’s C.K.’s ability to take dead serious problems from everyday life (like how to deal with your parents after you’ve been avoiding them for years) and alchemise them into comedic art that makes you laugh. Even when making use of stylistic devices like exaggeration and straight up Dadaism you can still relate to everything he does. An example is when he decides to run instead of meeting his father and doesn’t stop to catch his breath until he is far, far away. No “Brother Louie” intro in the last two episodes – sad. If I wasn’t already convinced of Louie’s dominance in the TV comedy arena, the last two episodes that aired left absolutely no room for doubt. In the interest of your own viewing pleasure, it would do well not to spoil to much, but I can assure you: I’ve never ever rooted more for a character than I did for Louie in these past two episodes. And if you still aren’t convinced (what is wrong with you?) David Lynch makes cameos in all these episodes, but Louie still manages to steal the show. What are you waiting for? Watch it!